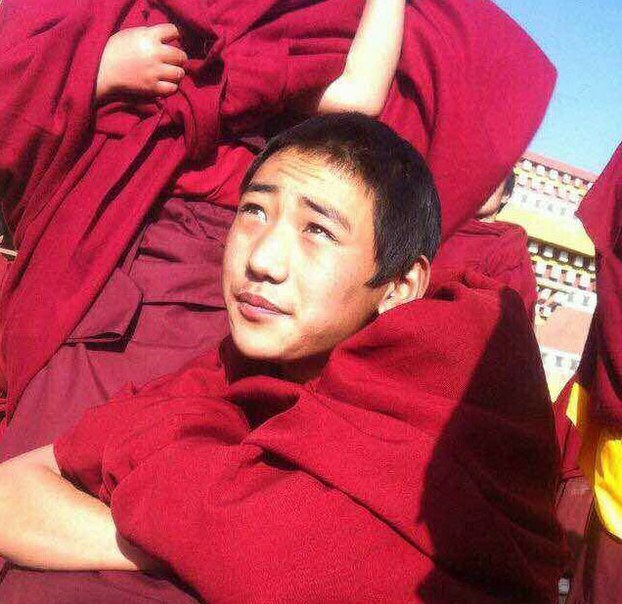 (TibetanReview.net, Mar10, 2015) – Chinese authorities in Ngaba County of Sichuan Province have detained a teenaged Tibetan Buddhist monk on Mar 8 after he took out a lone street protest, demanding the return of Tibet’s exiled spiritual leader, the Dalai Lama, and equal rights for all Tibetans. Gendun Phuntsok, an 18-year-old monk of Kirti Monastery, took out his protest in the main county-town at around 1:30 pm. He held up a large portrait of the Dalai Lama adorned with a yellow ceremonial scarf and shouted the above slogans. The protest only lasted minutes as a group of patrolling Chinese security forces took him away. The monk originally belongs to Cha Village, in the county’s Chuglay Gapma Township, where his parents, Tagya and Riggo, live. The incident took place as China had greatly strengthened security in many Tibetan areas, including Ngaba County, ahead of the 56th anniversary of the Tibetan National Uprising on Mar 10.